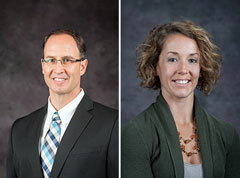 The College of Human Ecology recognizes Kevin Sauer, associate professor, and Jillian Joyce, doctoral student, both in the food, nutrition, dietetics and health department, with 2016 Bedford awards. Sauer was selected to receive the 2016 Mary Ruth Bedford Distinguished Faculty Award and Joyce was selected to receive the 2016 Mary Ruth Bedford Graduate Teaching Assistant Award. Sauer is a registered dietitian nutritionist with administrative experience in child nutrition programs, college and university dining, and healthcare food and nutrition services. He teaches administrative dietetics courses and conducts research in management practice, food safety and food allergies in dietetics. He is a member of the research leadership team for the Center of Excellence for Food Safety Research in Child Nutrition Programs in the College of Human Ecology. He is chair of the Commission on Dietetic Registration, and serves on the Food Service Systems Management Education Council board and the Governing Council for the School Nutrition Association board. Sauer has a bachelor's degree in dietetics, a master's in foodservice, hospitality management and administrative dietetics, and a doctorate in human ecology, all from Kansas State University. Joyce is a registered dietitian and a doctoral student in human nutrition with healthcare experience in nutrition therapy for inpatient, outpatient and home health clients, and has conducted nutrition education for Army families and their children and county public health service. Her interests include eating disorder nutrition therapy, sports nutrition and child nutrition. She is conducting her doctoral dissertation research in the Physical Activity and Nutrition Clinical Research Consortium, or PAN-CRC, facility. In addition to the Bedford award, Joyce is the recipient of the Kathleen Newell Graduate Scholarship in Nutrition and the Nutrition in Youth Scholarship. She is a member of the Academy of Nutrition and Dietetics and the American Society of Nutrition, in addition to serving as an ambassador of the food, nutrition, dietetics and health department to the Human Ecology Graduate Student Council. Joyce earned a bachelor's degree and a master's degree in dietetics from the University of Pittsburgh. The Bedford awards are supported by Mary Ruth Bedford of El Paso, Texas. The distinguished faculty award is presented to a faculty member involved in dietetics and food service management who has demonstrated excellence in teaching and research. The graduate teaching assistant award is presented to an enterprising graduate student as an endowment to further their studies and research. Bedford graduated from K-State in 1971 with a master's degree in dietetics and institutional management, and she earned a doctorate in adult education in 1975.